This is absolutely amazing. 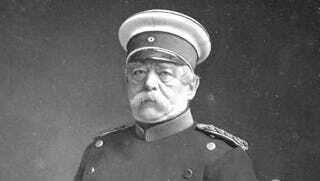 Audio archeologists have uncovered a wax cylinder phonograph record that bears a lost vocal recording of Prussian statesman Otto von Bismarck. This cylinder was discovered in 1957 inside Thomas Edison's lab — next to a cot where Edison would nap — but the recording languished unlabeled until last year, when researchers at the Thomas Edison National Historical Park determined that a group of unmarked cylinders contained the voices of 19th-century German political figures like Bismarck and famed strategist Helmuth von Moltke. How did Edison acquire these aural treasures? To market the phonograph in the late 1800s, Edison hired Adelbert Theodor Edward Wangemann to travel around Germany and record political figures of the day. On October 7, 1889, Wangemann captured Bismarck's Prussian pipes. He did not want to play into the hands of his political opponents and so did not speak a message to the Germans on both sides of the Atlantic as Wangemann had expected and possibly prepared. Instead, he first recited some innocuous material into the recording horn: the first strophes of the songs In Good Old Colony Times and Gaudeamus igitur, as well as the beginning of the poem Als Kaiser Rotbart lobesam. More noteworthy are the first lines of the Marseillaise which follow. Excerpts of the content of this cylinder were disseminated in Germany as well as in the United States-but with the interesting difference that the German press, as far as it is available to me, made no mention of the recording of the Marseillaise. In conclusion, Bismarck directed an appeal to his son Herbert, who heard it via phonograph in Budapest several weeks later and recognized his father's voice. Bismarck's call for the moral life of his son ("Sittlichkeit" or "morality") became almost inaudible through damage to the cylinder, and it was never mentioned even in contemporary press reports. Here's the MP3 file of Bismarck's dulcet tones, and you can read more about Edison's lost cylinders at The National Park Service's website.